Thor: Ragnarok made some major revelations about Odin’s past. When Hela escapes from her eternal prison, she’s unveiled as the forgotten firstborn of the All-Father, originally his deadliest weapon in his bloodthirsty tirade to conquer the Nine Realms. His evil daughter reveals that after succeeding in his goal, he wiped away his dark past and became the benevolent ruler of Asgard that we’re familiar with from previous movies. 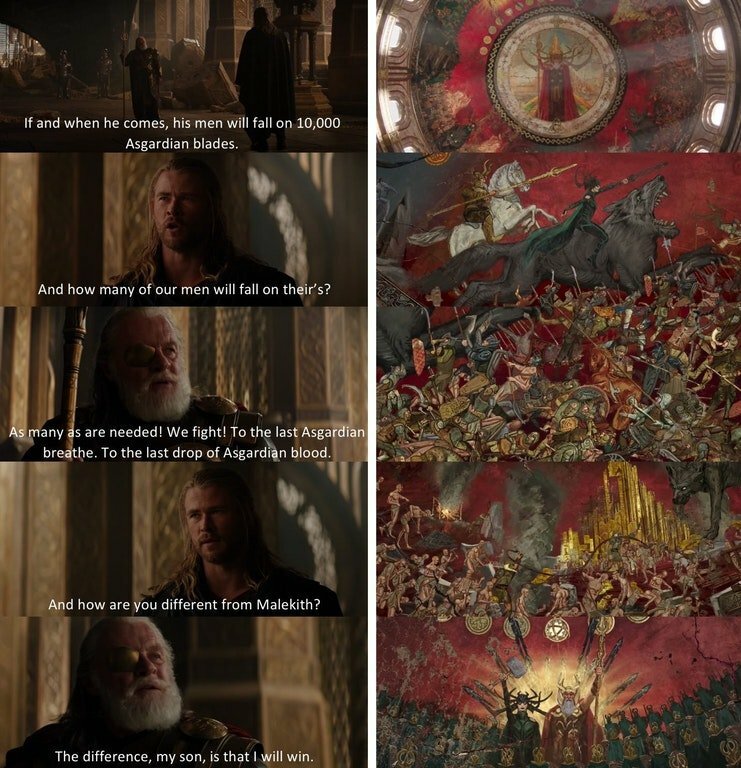 However, upon rewatching Thor: The Dark World, one Marvel fan’s noticed a moment when the old warmongering Odin came back out. Following his wife Frigga’s death at the hands of the Dark Elves, Anthony Hopkins’ character tells his son that he wants to rein fiery vengeance on his enemy Malekith “until the last drop of Asgardian blood” is spilled. This is a chilling scene from Dark World, as it’s unlike the Odin that Thor looks up to so much to be so callous and warlike with such little regard for the safety of his own people. Sure, his wife’s just died so he’s not in the right frame of mind but, like Chris Hemsworth’s Thunder God says, that course of action would make him no different from Malekith. The Redditer’s right, too, as in the context of Ragnarok‘s spilled secrets, it does seem like Odin is returning to his youthful love of violence for a moment there. Fans have become quite fascinated with the revelations about Odin’s past. Put together with the fake Infinity Gauntlet he has in his vaults and it’s often assumed that, when he was still conquering other worlds, he may have wielded the Infinity Stones himself, long before Thanos was around. It’s possible that the cost of using them is what caused him to rethink his life and become a better monarch. Tell us, have you spotted any other moments of foreshadowing in the Thor movies that lead up to Ragnarok? Join the conversation in the comments section down below.